A research paper has just been published in journal Nature Physics, by a team of scientists led by Ofer Yaron, from the Weizmann Institute of Science in Israel. In this paper they told that they witnessed a red supergiant exploding into a type II Supernova. The phenomenon occurs when a star become at least eight times heavier than the sun and collapses as a result of its own gravity. Scientists have just acquired the first observation of the early stages of the intense event that has been observed just hours after the explosion. These findings would let scientists understand what happens actually just before the destruction. The observations are showing a huge disk of matter accumulates in the years running up to its breakdown. With the help of Intermediate Palomar Transient Factory (iPTF) scientists spotted the exploding star back in 2013, Located in NGC 7610, a galaxy in the Pegasus constellation about 160 light years away, the star was then witnessed by astronomers using a variety of telescopes, the data from which was collected to be evaluated. The pre-supernova evolution of massive stars, which sets the physical backdrop to these violent events, is theoretically not well understood and difficult to probe observationally. Here we report the discovery of the supernova SN 2013fs a mere three hours after explosion. More explanations indicated the star had been surrounded by a disk of matter which caused the explosion, with this material being emitted in the final year. Without the knowledge of when and where are going to explode, we tend to chance upon them when they are already several days old. By this time, the supernova ejecta have already swept through a large volume, destroying any information about its immediate environment. The first spectroscopic observation is thus a remarkable achievement, revealing that the dying star was embedded in a dense shell of gas. 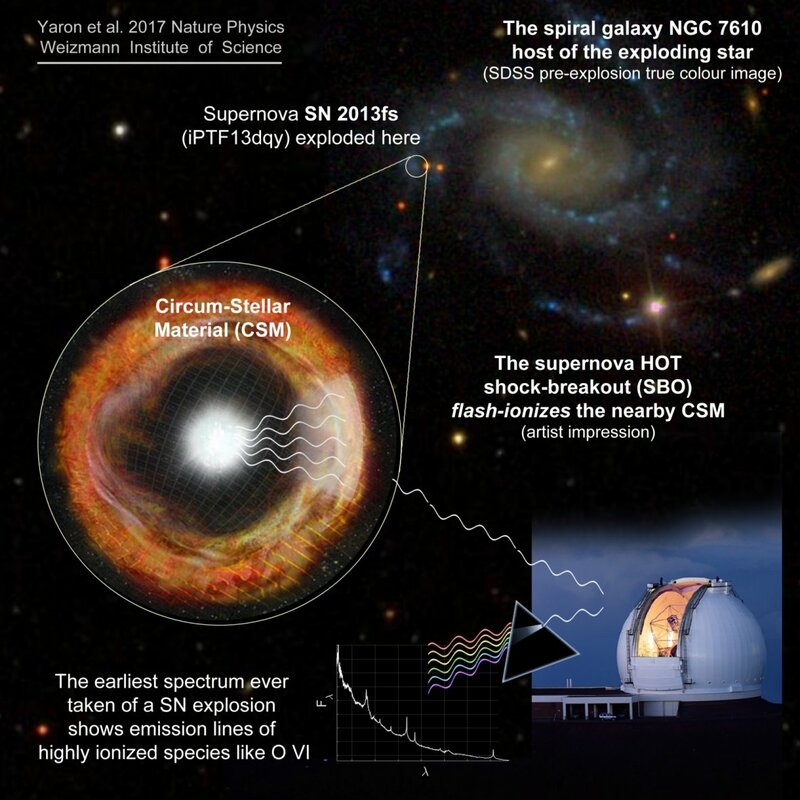 Increasing supernova surveys should mean we are able to record more early-stage supernovae in the near future, providing an ever-better view of these events. We can thus hope that the early spectroscopic observations of SN 2013fs are the first of many more to constrain the pre-supernova circumstellar density distribution, the atmospheric structure of red supergiant at the time of their explosion, as well as the shock break-out phase. 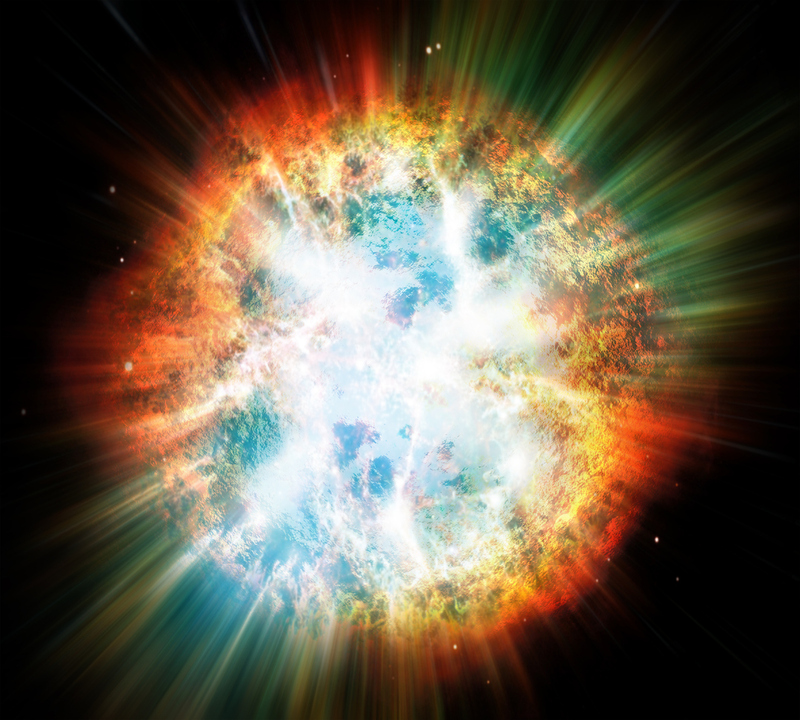 As red giant supernovas are a fairly common, scientists say the uncertainties observed about the exploding star could be a phenomenon seen in many other exploding enormous stars.